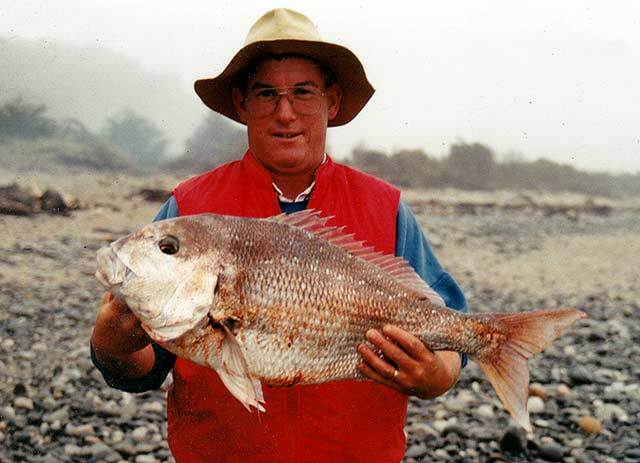 Snapper caught Cliff Simpson from Gentle Annie Beach. 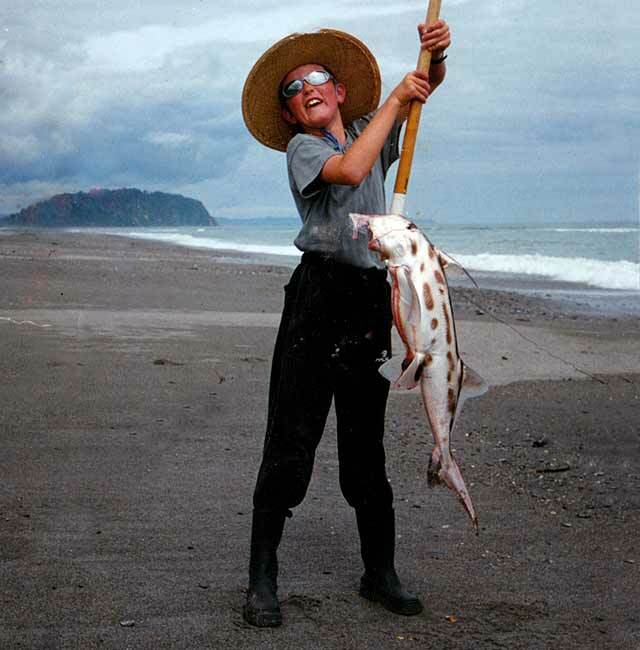 You can catch snapper, kahawai, rig shark, conger eel, stingray, gurnard and other species from Mokihinui Gentle Annie Beach. It is steep, shelving, shingle beach with deep water well within casting range. 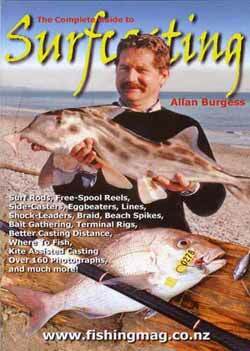 I was there one year when a bloke caught a blue shark off the beach and another angler landed a big stingray! One year Ron Prestage caught a huge 38kg eagle ray to win the Christmas holiday surfcasting contest open section. Mokihinui’s Gentle Annie Beach. There is good deep water close to the beach. At times there can be large numbers of red cod caught from this beach. A fishing contest is held over the Christmas holiday period. It runs for 10 days and is popular with campers staying at the river mouth camping ground. This is a beautiful part of the world with excellent fishing. Also brown trout in the river. Excellent white-baiting during the season. There are also brown trout in the river but they can be difficult to catch when the river is low over summer. The Mokihinui River is popular with white-baiters during the season which starts on the Coast on 1 September. Half an hour by car north of Westport. 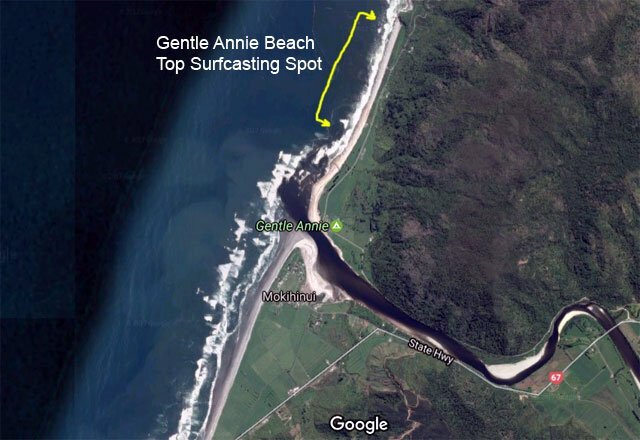 Mokihinui Gentle Annie Beach is a fabulous surfcasting beach on the north side of the Mokihinui River mouth. This really is a delightful wilderness area of mostly unspoilt native bush. The place is also popular with white-baiters during the season. You can catch snapper, kahawai, rig, conger eel, stingray, gurnard and other species from this steeply shelving beach so try a variety of rigs and baits. Kahawai can also be present in big numbers so be sure to carry some ticers and a spin rod. Better still why not target the kahawai from the beach and river mouth on light spinning gear. Indeed this is one surfcasting place where every time you cast out there is a good chance of catching a good eatable fish. The area seems to attract its fair share of sharks with rig and big school sharks in summer. It is always with having a good size shark bait out on at least one rod when surfcasting. Try a variety of baits to appeal to different species. 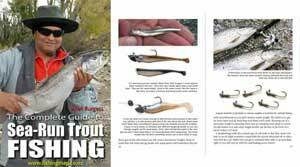 There are plenty of yellow-eye mullet around which make ideal surfcasting bait. Be sure to apply plenty of bug spray especially in the evening as there can be a lot of sand flies on the beach. Many people from other parts of the country often mistakenly believe that in rains all the time on the South Island’s West Coast. During the Christmas period sure it can rain sometimes but the beaches on a hot day can seem positively tropical. 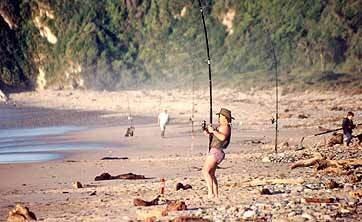 The Mokihinui River, with its camping ground, and Gentle Annie surfcasting beach is a fantastic fishing holiday fishing destination. Gentle Annie, Accommodation, Camping, Cafe, and Photographs. 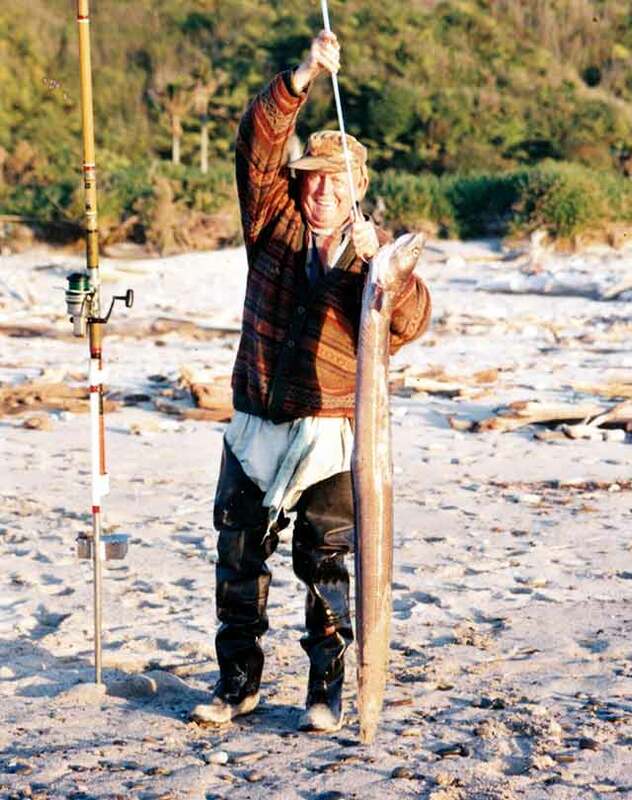 The late Joe Chidgey with a conger eel caught surfcasting at Gentle Annie Beach. Airbus, TerraMetrics, Data SIO, NOAA, US Navy, NGA, GEBCO. Elephantfish from Gentle Annie Beach, Mokihinui.